Click a catalog below to view photos, videos, music clips and descriptions. 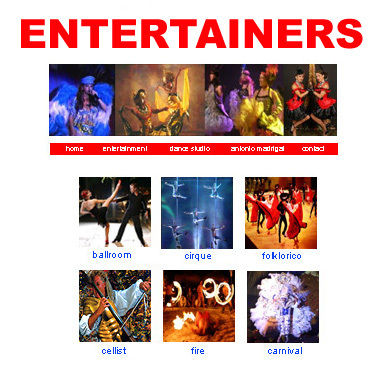 We have been providing the best in entertainment for over 20 years. Whether corporate, private, weddings or any special event, our entertainers will put the passion, elegance and excellence in your event to create a most memorable affair. and make your next special event more successful! Choose from a number of disc jockeys and karaoke DJs for all styles of music mixes. Even DJs with live singers. Lighting, intelligent lighting, bilingual DJs, emcees and dance instruction are also available. We match our DJs to your needs and provide you with our music suggestion list to ensure your choice of music is played. For weddings, be sure to ask about our creative emcee twists on traditions to leave every guest with a smile on their face! Browse our list of entertainment ideas categorized by theme to coordinate your entertainment, props, photo opportunities, and more to speak your theme and design the perfect special event!